Iron ore imports, which have been rising since the beginning of the financial year, have started declining in the last couple of months. Imports had surged 157 per cent in the nine months of FY19 to 11.5 million tonnes compared to the same period in the previous year. In July 2018, imports peaked to 1.93 million tonnes, the highest in a month in the past five years. A decline in imports was witnessed from August 2018. This was due to strengthening of the dollar, which reduced spreads between landed cost and domestic prices of iron ore, making imports less preferred by Indian steel makers during the period. Domestic prices are expected to go up by 7-10 per cent. Despite this, these rates would still be cheaper compared to imports as global iron ore prices are expected to go up further because of a demand-supply mismatch. This has happened owing to rising prices of ore in the international market, prompting NMDC to react to the market forces and raise prices. Currently, the landed price of 60 per cent of iron ore from NMDC in Karnataka is Rs 3,127 per tonne, against Rs 6,051 for imported iron ore, showing a stark difference in prices. Global prices jumped owing to various reasons, including the accident in one of Brazil’s mines. “Prices of high-grade lumps and fines rose 65 per cent and 25 per cent in FY19 (up to November 2018) and reached their highest level in the last five years. Domestic prices are largely dependent on the country’s steel market rather than international iron ore prices,” said Vahishta M Unwalla, research analyst at CARE Ratings in a report. Global iron ore prices also peaked in January and February this year, reaching $88/per tonne, the highest since August 2014, which was due to the Vale’s mine dam collapse in Brazil in January. The concerns regarding supply crisis has inflated the global prices of iron ore.
“I foresee imports of low grades reducing. Demand is strong and prices are going to be stable with a bullish outlook. Production is also stable and likelihood of exports will come as a big fillip to the mining sector,” said Basant Poddar, managing director, Mineral Enterprises Limited (MEL) and member of Federation of Indian Mineral Industries (FIMI) South. Production of iron ore is expected to grow by two to five per cent, with the domestic demand also seeing a strong growth during the year. Domestic demand is expected to be met by the huge iron ore inventory piled up at the mines, in addition to new production during the year, said the CARE report. Exports of Indian iron ore pellets are expected to be around 8-9 million tonnes by the end of FY19. According to a big miner in Karnataka, it is the only state to witness high imports during FY19 even though enough material is available domestically. It alleged that miners have already started facing the turmoil of unsold inventory as a result of imports which is coming at a much higher price as compared to Karnataka ore prices. 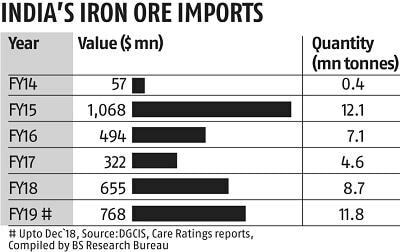 “Any amount of iron ore import to Karnataka is not only a threat to miners with inventory getting piled up but also to the state exchequer, resulting in a major setback to economic growth. Such action will eventually lead to stoppage of production and unemployment,” it added.